Get extra rest. Slow down just a little from your usual routine. You don’t need to stay home in bed, but try not to expose others to your cold. Drink plenty of fluids. Hot water, herbal tea, or chicken soup will help relieve a stuffy nose and head. Take aspirin, ibuprofen (such as Advil or Motrin), or acetaminophen (such as Tylenol) to relieve aches. Follow the package instructions carefully. If you give medicine to your child, follow what your doctor has told you about the amount to give. Do not give aspirin to anyone younger than 20. It has been linked to Reye syndrome, a serious illness. Don’t take cold medicine that uses several drugs to treat different symptoms. For example, don’t take medicine that contains both a decongestant for a stuffy nose and a cough medicine. Treat each symptom on its own. A nasal decongestant spray can help your stuffy nose, but make sure you don’t use it for more than 3 days in a row. You could get a “rebound” effect, which makes the mucous membranes in your nose swell up even more. Cough preparations can cause problems for people who have certain health problems, such as asthma, heart disease, high blood pressure, or an enlarged prostate (BPH). Cough preparations may also interact with sedatives, certain antidepressants, and other medicines. Read the package carefully, or ask your pharmacist or doctor to help you choose. Cough suppressants can stifle breathing. Use them with caution if you are older than 60 or if you have chronic respiratory problems. 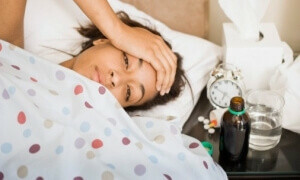 Be careful with cold medicines. They may not be safe for young children, so check the label first. If you do give these medicines to a child, always follow the directions about how much to give based on the child’s age and weight. For more information, see Quick Tips: Giving Over-the-Counter Medicines to Children. You have a fever of 104°F (40°C) or higher.